Dixie Diner Low Carb Pudding Mix is now available. Check out all of our tasty low carb mixes for dessert at Linda’s Diet Delites! Dixie Diner Low Carb Muffin Mix is now available in Chocolate Orange Ginger flavor. Be sure to check out all of our great low carb mixes and sugar free mixes online! 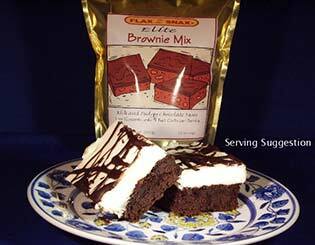 Flax Z Snax Low Carb Elite Brownie Mix is now available. Only 5 net carbs per serving. Be sure to check out all of our delicious low carb mixes at Linda’s Diet Delites! 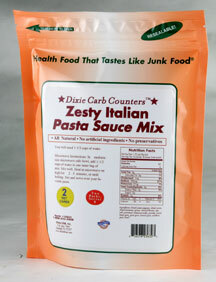 Dixie Diner Low Carb Pasta Sauce Mixes are now available in alfredo, zesty italian, or carbonara flavor. These mixes make excellent sauces that are both low carb and low calorie. Be sure to check out our wide range of low carb mixes at Linda’s Diet Delites! A new flavor of Dixie Diner Protein Power Muffin Mix is now available – Cranberry Orange, to compliment the already available Blueberry and Chocolate Chocolate Chip. Dixie Diner Tex-Mex Cheese (Not!) 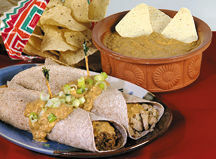 Bean Dip & Sauce Mix is now available. Be sure to check out our wide range of low carb mixes and sauces, only at Linda’s Diet Delites! Dixie Diner One Carb Bun & Roll Mix now available! We have recently added the Big Train Low Carb Cookie Mixes in Chocolate Chip and Peanut Butter flavor. We have recently added the Big Train Low Carb Buttermilk Pancake & Waffle Mix. Big Train Buttermilk Pancake & Waffle Mix is an excellent alternative to high carb pancake mixes. This great mix makes pancakes that are only 7g of net carbs per serving and 2g of net carbs per pancake.